George Clooney's swank Oscar swag bag has fetched thousands at auction. Clooney donated the bag to the United Way, and Wednesday it sold for $45,100 in an extended online auction that began March 21, organization spokeswoman Sheila Consaul said. The winner was not immediately identified. The money will benefit the United Way's hurricane response and relief recovery Fund, Consaul said. The bag given to presenters at the 78th Annual Academy Awards included a BlackBerry 8700c, a Kay Unger kimono and a cultured Tahitian-pearl necklace. 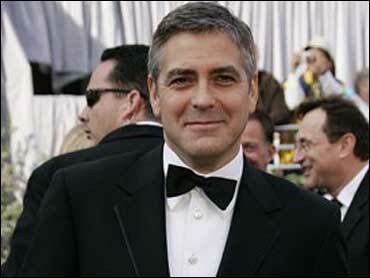 It's Clooney's practice to make donations when receiving such gifts, said the actor's publicist, Stan Rosenfield. The auction was scheduled to close at 11:59 p.m. Tuesday but was extended 41 minutes because of a high volume of bids. At the Oscars, Clooney won best supporting actor for "Syriana."